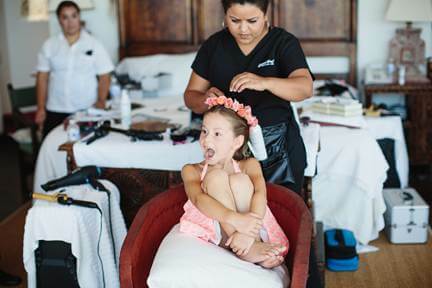 Whether it’s your daughter, niece or your best friend’s little one, including children in your destination wedding always makes for unique and special memories. Kids are fun, they’re unpredictable and they get so excited about being included in the celebration. It’s hard not to smile just watching them get ready for their part! The little lady in these photos got her hair and make-up done before surprising her father with a special “first look.” We adore this idea! The photographs by Sara and Rocky really tell the story of this cutie and her special wedding-day role. 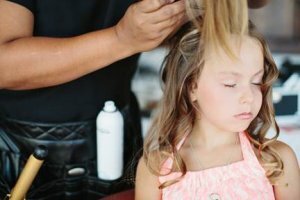 We style kids of all ages, so please don’t hesitate to contact us about children’s looks when scheduling your Cabo bridal party hair and make-up! 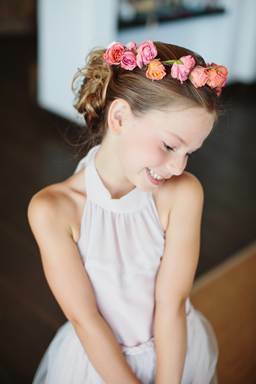 This entry was posted in Cabo Bridal Hair and Makeup and tagged Cabo children's wedding hair, Cabo wedding, children's wedding hair, children's wedding style, fun Cabo wedding, kid's wedding hair, Suzanne Morel.